In May of last year, Hannah and I took a two week sojourn out to Japan. It was a majestic trip that threw us into the deep end of culture shock, but it's an experience I highly recommend to anyone that can manage it. On the second day of our visit, we took an 8 hour long tour of Tokyo, walking through some of its historical areas of interest and major cultural centers. We walked just a little over 13 miles, and let me just say, you don't realize just how out of shape you are until you walk that amount with a 70 year old man who is barely breaking a sweat. At one point, sometime between observing a Shinto wedding and strolling through a Buddhist temple, Kenji (our guide) discussed with us how Buddhism spread throughout Japan - by way of China and Korea - and how both faiths tend to interplay in the traditional ceremonies of today's Japanese citizens. One of the questions I asked, given its relative abundance throughout the Western World, just how many Christians happened to live there. "Very little", he said, "1% maybe, maybe less". And he's right, less than 1% of the Japanese population identifies as Christian. An astonishing statistic, and beyond the eventual wiki-rabbit hole it led me down in order to determine the religious percentages of various East Asian nations, in the moment, I wondered just why one of the world's predominant faiths never took hold in such a global and cultural center. Silence does a rather exceptional job making a case for why that might be, both through a somewhat shaded cultural lens, but also in historical precedent...or at least as much as a fictionalized narrative of a real life person can. In the latest film by, arguably America's greatest veteran living filmmaker, Martin Scorsese, he adapts the historical novel of the same name by Shusaku Endo; and in doing so, returns him to a more contemplative place of filmmaking. Rather than his trademark tracking shots and go-to rollicking 60's and 70's rock infused soundtracks that have become the place of homage (just check out Boogie Nights or American Hustle for two easy examples), this plays more to the Scorsese that filmed the, at times, quieter affairs The Age of Innocence or, better yet and more obvious, The Last Temptation of Christ. 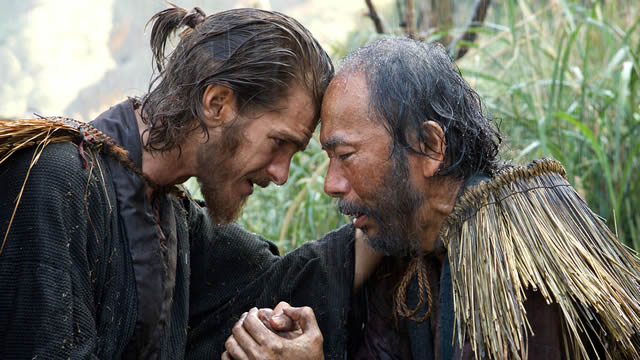 The film charts the journey of Sebastio Rodrigues (Andrew Garfield) and Fracisco Garupe (Adam Driver), two young Portugeuse missionaries who are sent to Japan to discover what happened to their missing mentor, Father Ferreira (Liam Neeson), who has last been heard from as being captured by Japanese imperial forces and was rumored to have become an apostate. Once they arrive, they find a persecuted people who study the teachings of Christ begging for their help in hope for salvation and the continued spread of their faith. Unfortunately, they also face incredible resistance from the shogunate, for whom no method of torture is too extreme in order to procure a renouncement from these hidden Christians. It's an incredible film that needs to be experienced for yourself to understand the scope of this intimate epic. Scorsese not only expertly delves into the idea of how religions spread, be it through the power of belief or through force, but also what the power of faith means to those who find resolve through it. Beyond the sheer beauty of the film itself, I was struck by how even-handed this material was handled. Obviously as a lapsed Roman Catholic, visually translating the story of a Roman Catholic of Japanese origin, the viewpoints herein have a very specific skew. On the other hand, that isn't to say that Scorsese simply presents Christians as the cut and dry heroes of this story, rather there is an argument to be made - and it is certainly presented as such by the Inquisitor (Issey Ogata) and his enforcers - that the suffering of these people is a direct result of the influence of the various European nations that attempted to nation-build within Japan's borders. And to some extent, this becomes a deeper study of how fervent religious belief and the need to proselytize begets violence. These two philosophies are constantly at war within Silence's nearly three hour running time, which breezes by, not only on its strong philosophical underpinnings, but on an extraordinary character arc with Garfield front and center as someone whose commitment to his own faith is continually challenged at the risk of mortal peril, to himself and those who rely on his guidance and leadership. In many ways, this is the culmination of Scorsese's ongoing fascination with catholic guilt and redemption. While Garfield will receive the lion's share of attention here, given he becomes the focal point by which all of the film's ideas shift, it cannot be understated how strong the supporting cast here is. Driver is so outstanding, that at times, I somewhat pondered what a version of Silence would look like with him at the center - though Garfield is a strong central player in his own right. But it's some standouts in the cast that surround them that elevate the film, with Tadanobu Asano playing one of the best villains of 2016, a sneering snake of an interpreter who is consistently the proverbial devil on Rodrigues' shoulder. Having seen Asano utterly wasted in multiple stateside films, it's refreshing to find his immense talent put to actual use. In addition, Yosuke Kobuzuka adds an ongoing air of humor tinged with tragedy in a unique character who consistently seeks forgiveness, but cannot overcome his own cowardice in order to do so. And the above mentioned Ogata creates a compelling and transformative character all his own, as the leading figure of conflict. Silence is a wonder of a film, being both massive in scope while also impressively restrained, acting as an important piece of religious history and an engaging personal odyssey. It is, simply put, another masterwork in a long line of them from one of the pillars of modern cinema.